Both of these signals have proven very profitable in the past, but as they say in the Madoff penthouse, past performance is no guarantee of future success. Inspired by a suggestion from avid AllAllan reader, supporter & contributor, Professor John W. Kercheval, III, what follows is my selection of the top 10 AllAllan blogs/trades/picks from 2008. My selection process was a subjective evaluation based on results, timeliness, character and substance, all of which were determined by me on Christmas Day, 2008. In true David Letterman fashion, here they are, in reverse order and culminating with what is probably the most important piece I've ever written. Note: All returns, unless otherwise indicated represent the gains from the opening price the day after the blog in question was published to the highest extreme price, high for buys, low for sells subsequent to publication. If anyone has a problem with that determination, please provide a link to your own blog. July 6th: Buy SRS On the next day, SRS opened at 108.83 and reached a high of 240.27 on November 21st, for a gain of 120%. 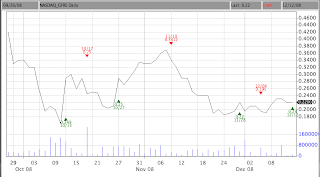 I didn't get out at top tick, but I did get out not long after based on a simple trailing stop. But this is what was possible, depending on your exit strategy. 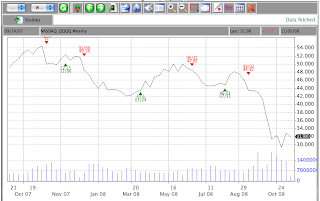 June 19: Buy HGYS Next day HYGS opened at 1.05 and one week later, on my birthday, July 2nd, hit a high of 2.45, for a gain of 133%. As with SRS, this one got trailed out soon after trading at it's high, based on a theory that doubling your money in a week mandates a tighter stop then usual on at least half of your position. June 22: Buy FSYS This was the Louis Navellier teaser that was discovered and communicated over my blog as a, "$32 Fuel Conversion Stock to $64 by July 7″. 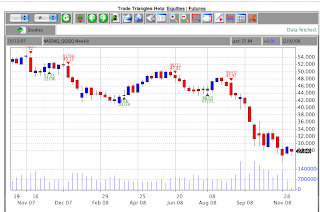 Next open was 36.37 and it traded as high as 61.24 on August 19, for a gain of 68%. I know it's gain was smaller then the two above it, but, it was a much cooler pick. 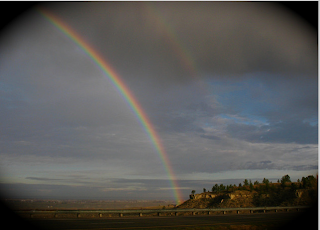 The above three picks exhibit what is possible from trading, depending upon personal trade management. I don't claim, nor do I expect anyone to pocket the entire gains posted above. But that doesn't diminish the value of the trade ideas at the time they were given. I supply the ideas, you do what you will with them. Capturing half the maximum potential is a realistic approach to these picks, especially when they are so front loaded with gains. Feb 19, Apr 1 & Apr 15: Buy NNVC There were a lot of write-ups on NNVC, but lets face it, I was banging the table to buy NNVC back in February when it traded as low as 0.39. By the time I posted my Feb 19th piece, it was trading at 0.51 (on April 1st it was 0.53 and April 15th 0.63) and ran all the way to 1.78 on June 18. That represents gains as high as 250% in just a few months. 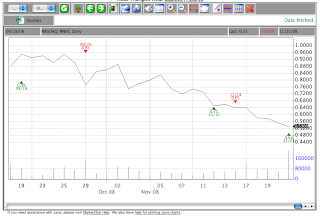 As you know, I don't trade NNVC and have only bought additional shares this year, not sold any. But I know some readers fancy themselves good enough traders to trade in and out of NNVC and still be in it when it quadruples overnight on some news event. I may be good, but am not that good to expect I can trade it and will be lucky enough to be long when some blockbuster news hits and a triple digit percentage windfall hits. Still, the traders among you had a good one here. 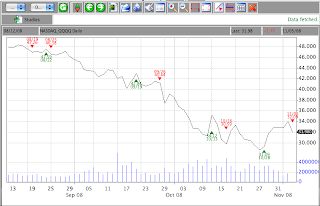 on the open, July 8th, at 204.90 and ridden it all the way down to it's lows on Dec 5th at 47.54 for a gain of about 330%. Even if you are still holding short at 67 and change, your return is just over 200%. Primo by any standards. 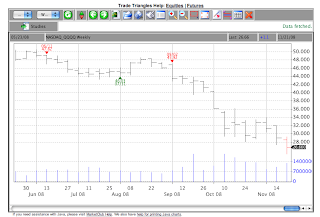 A late July sell at 162 has led to a decline all the way down to 79 on December 5th, for a return of 46%. Again, 46% is less then half of some of the other Top Ten picks, but Apple Computer was such a darling stock early this past year, touted far and wide, including James of Buffoonery the Cramer, that sniping 46% on the short side seems to me to be a lofty achievement. Note: Advanced GET is showing that as of December 25th prices have completed a complete five waves sequence down for Apple and the false bar stochastic is in an area where it can turn up and trigger a Buy signal. October 11: Invincible A personal note, because life takes some strange turns and because passion needs an outlet, in one form or another. Five years of upheaval reduced to five stanzas......and yet it still won't let go. 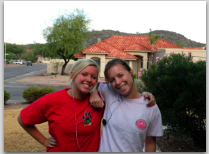 All the while this blog has chronicled my journey, serving as a loyal and trusted friend in some of the darkest moments. Invincible brings the saga current. In double beta ETF's gains of 100%. In underlying options on the QQQQ gains of 200% rolled over for more gains of 200% and rolled over for yet more 200% gains. Perhaps one of my greatest calls of all time, what was I thinking? The easy part was recognizing a culmination of a lot of technical analysis, most notably Elliott Wave, Triangles and a host of fundamental factors converging on the market as a Perfect Storm. The hardest part was going public with what I feared was upon us. In four years of writing this blog, not once, not once, have I used the word "crash" to describe what I saw coming in any time frame. Early September changed all that and introduced a new tool to address the big picture, The Elliott Wave Principle. Going forward, we will integrate Waves in our shorter term analysis, along with Advanced GET, my software tool for exploiting Waves by isolating specific trading patterns and larger, tradable themes in the markets. November 2, 2008: Barack Obama replaces George Bush as President of the United States. "Because this one, he is different, because this one, he reaches that little boy of ten, because this one makes this man in his fifties feel that he can make things better with a single vote, because of this, I am voting Tuesday, for Barack Obama." 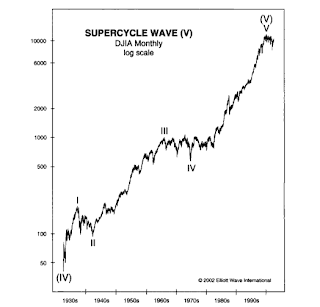 My friend Ilene has a series of posts up on Phil's Favorites comparing Elliott Wave analysis from three different perspectives, including my recent "Wave 5" post (you may have to scroll down a few articles to get there). All three of us come to about the same conclusion, but the uncertainty in details may make it hard to make trading decisions based just on the Elliott Wave analysis. Due to the nature of the Elliott principle, definite assignment of wave numbers and letters cannot be made until after the fact, AND, even then, there's no consensus. 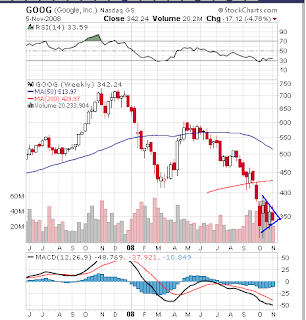 My analysis provides a specific trading guide for getting into the next leg down -- a practical application of theory, i.e. 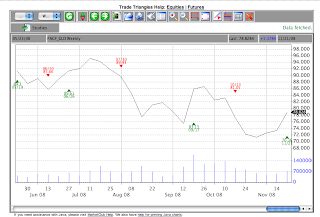 how does a trader turn theory into a real time, real money trade? Enter Advanced GET. I have been using this software since 1995. Until very recently the program could only be run on Windows operating systems. With the advent of the new MacBook Pro, I can now run Windows programs on my Mac and the first Windows software I installed was Advanced GET. This program reduces Elliott Wave Theory to a couple of very tradable mechanical trading signals along with a host of supporting proprietary indicators like no others in any trading environment. Almost every one of these indicators is used to further refine Elliott Wave concepts into something that is actually tradable. With this as an introduction, I want to walk through a few Advanced GET charts of the S&P 500 in different time frames and point out how theory can be distilled into something eminently tradable. 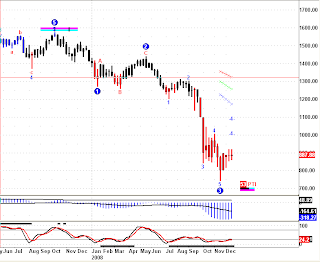 On the longer term Weekly chart the SPX is in the midst of a 3rd wave down. Two prominent markers stand out. First, that the S&P can climb as high as 1000-1100 and still be considered to be in a third wave down and second, that the software is citing the 700 level as initial support, but that by its wave count, the ultimate bottom of wave 5 is several hundred points lower. Interesting, but hardly the precise measurements we need to put on a trade. The daily chart is almost identical to one I posted on Thursday night. Unlike the weekly chart, the daily chart is providing some precise parameters for where the software believes Wave 5 will commence, the breaking of the auto-regression channels, or taking out the Wave 3 low, or in the bottom window, the cross-over of the GET stochastic. There are other indicators, such as the GET oscillator (window just above stochastic) going from way oversold all the way back to the zero line and an almost completed abc for Wave 4. As you can see, the probabilities are lining up for a trade to downside here and although no one indicator is in and of itself sufficient to base a trade upon, the culmination of so many all saying the same thing is something a trader can actually handicap into a successful trade. Above is the Daily chart along with GET stochastic signals, also called the "False Bar Stochastic." This is one of the most powerful stochastic indicators I have ever come across. It filters out "false" stochastic signals (see horizontal black lines) leaving only the most highly probable stochastic cross-overs for trading. 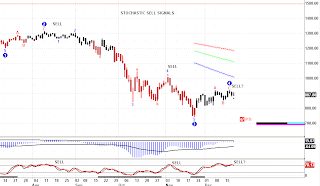 I've posted "Sell" signals on the chart where each of the recent False Bar Stochastic signals have been generated as well as over current prices where it appears that the third Sell signal is upon us. If so, one can easily conclude that an entry for an expected Wave 5 drop is imminent. Finally, above is a very short-term chart, a 10-minute chart of the SPX. The blue horizontal lines are where the software, in advance, alerted to where the index would reach at least a minor support level. The first horizontal blue line was generated by the first red price bar, 20 bars in advance of where the SPX found its support on Friday. 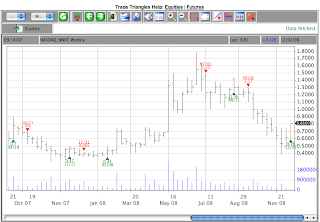 But note that there is another horizontal blue line at the bottom of the price chart and running well into the future. That is where Advanced GET is suggesting the next level of support will be found, at about SPX 865, more then 20 points lower. This is where theory and trading come together to provide excellent risk:reward parameters for real trades. The software applies basic Elliott concepts to it's own proprietary system providing rule-based signals with tight stops and huge rewards trades. Although it may be a departure from pure Elliott theology, it's result is a pragmatic application in a trading environment. 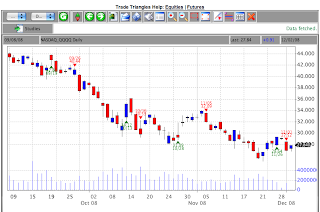 In earlier blogs I introduced Trade Triangles a simple mechanical system for trading stocks and indices. Recently I introduced Elliott Wave theory as applied by Robert Prechter and Glenn Neely as big picture analysis of where we are and where we are going. Advanced GET can be looked at as an approach to trading that combines the simplicity of mechancal, objective systems with the fascinating theory discovered by R.N. Elliott and widely practiced but seldom applied very effectively by analysts today. It is a very expensive program ($3,000) and is not for everyone. But it is for me, a Fibonacci 13 years and still going strong. 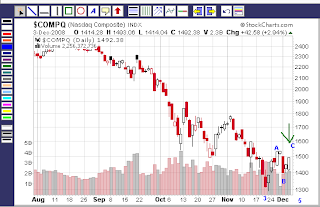 As the chart below illustrates, time is running out on the Wave 4 corrective rally. 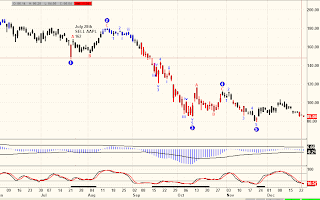 At it's completion, Wave 5 will commence with a target at or below the indicated support level 700 on the SPX. What I am looking for is some indication that Wave 5 has started. The first clue will be prices dropping down to break the Wave 4 regression channels. Another trigger will be a drop below the Wave B low late last week and a third trigger will be a False Bar Stochastic cross-over below the 75 level. 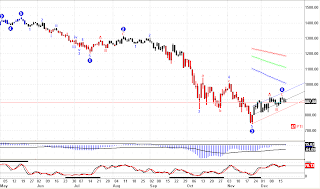 Any or all of these technical patterns will suggest Wave 5 lower has begun with an initial target of SPX 700. One of the most profitable stock market patterns is the Bull Trap, defined as an upward thrust in prices that suddenly reverses, trapping unwary investors in long positions while the market tumbles to new lows. It is in the throes of the thrust when it so very hard to short, making those that are so inclined so well rewarded for their efforts. Multi-year bear markets do not end because the Fed lowers it's target interest rates. The bond market had already priced government securities within the new targeted range well before the Fed acted. Today's rally, so enticing, so Crameresque --did you catch him jumping up and down on CNBC worshiping at the alter of Ben the Bernanke, exhorting all to Buy, Buy, Buy--what are the chances this guy is getting it right this time? Lots of questions in my email bag today, asking me about this action and right you are to ask. It sure seems inviting, a turn-around economy and cheap stocks just off their lows. Except they are going to be a whole lot cheaper before any of this is over. 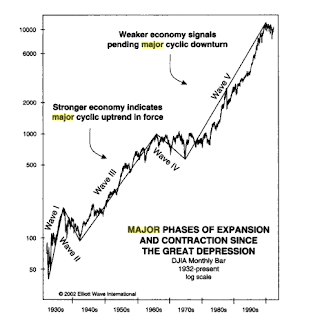 I kept the Elliott Wave labels off this chart in order to keep this as simple as possible. 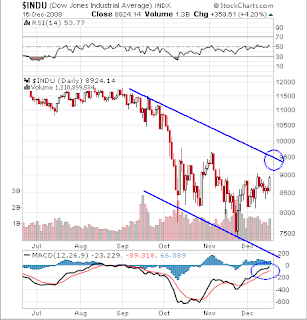 Instead, one downward sloping trend channel that contains all of the price movement from the past three months. Circled is the confluence of the top trend line and probable target for this rally, only a few hundred DJIA points higher. Also circled is the MACD which is spoiling for a cross-over that will take it a long way lower along with the market soon after that top channel line is addressed. There is nothing very bullish about this chart and it is showing everything we need to know about where we are, where we've been and most importantly, where we are going. Is it any surprise that as prices approach the top of the channel that market sentiment is turning gigly again? We are still 3,000 DJIA points lower then we were just this past summer, yet according to Cramer happy days are here again. The severity of the damage already done to our economy is poorly represented in media hyperbole surrounding a 300+ up day. Nothing is fixed, nothing has changed. 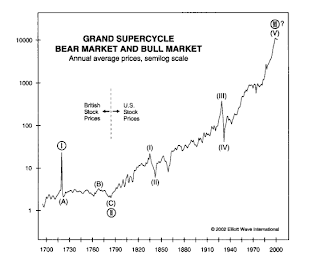 Cycles have to play themselves out and this rally is playing a crucial role in creating enough optimism, enough bullish sentiment with attendant buying power to fulfill the underlying structure of the Bull Trap from Hell. The only question is whether or not the trap door opens before or after Christmas? How utterly poetic to time the descent to coincide with the end of this Administration, timing rock bottom for the eve of Obama's new era. It's been awhile since I've introduced a new small cap stock pick and since 2008 has decimated equity valuations across the board, maybe it's time to go shopping. The stock universe is filled with companies selling at or below net asset value, companies involved with China, companies in niche markets, companies with a great story and companies selling at PE's in the single digits with growth in the double or triple digits. What is rare though is finding a single company that has all of these characteristics. Gulf Resources is a leading provider of bromine, crude salt and a portfolio of various specialty chemicals throughout China. Our products are necessary components for China's flourishing oil and paper-making industries. Gulf Resources is one of only six companies with a highly coveted Chinese license for bromine exploration, production and distribution. Bromine is a chemical element that is used in the refrigeration, medical, agrochemical, and oil field industries. While the international market is large and growing, China currently consumes all the bromine produced domestically. Gulf Resource will capitalize on the growing demand for bromine with its large proven reserves in Shouguang, China. In addition to bromine, our company manufactures and supplies crude salt, which is found in large quantities near the bromine brine wells. Gulf Resources also develops numerous specialty chemicals for China’s papermaking and oil & gas industries. Gulf Resources is aggressively pursuing complementary acquisitions, which coupled with sustained organic growth, will help us become a dominant worldwide player in the bromine and specialty chemical industries. 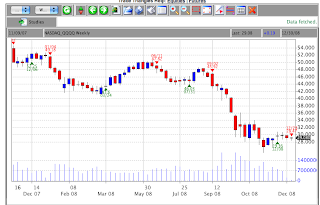 Above is a Weekly chart of GFRE. It is still in a longer term downtrend channel but only a few cents away from a major breakout. A breakout on the Weekly chart would confirm an MACD cross-over Buy signal and suggest an attempt at the 50 day moving average up at 1.35, a 400% advance from current prices. I've also included a smaller term uptrend channel forming since mid-October. The top of this channel is about 0.45, a 100% gain from current prices. 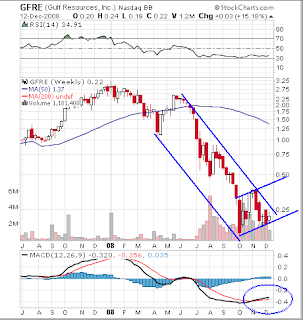 On the Weekly Market Club chart GFRE is still on a Sell signal. But it would only take a pop above 0.25 this week to generate a new Buy signal. Below is the daily chart, it flipped to a Buy on Friday and any strength this week, related or unrelated to this blog, will easily challenge the Weekly chart to get on board the bullish trend. Earlier this year, with GFRE trading at $2.80, Equities Magazine did an excellent write-up on the company. Below are some highlights and below that, a link to the article. But for the market crash, this was a good speculative buy at $2.80. At $0.22, it is a no-brainer. GFRE is one of only six companies that hold a license to produce bromine in China. They already are China's largest bromine producer. Bromine is used in agriculture, oil and gas drilling and papermaking. China is still a net importer of bromine, meaning GFRE can sell everything they can produce to the world's fasting growing market. The world market for bromine is about $1.2B with $249M coming from China. THIS IS A COMPANY WITH 20% THE CHINA MARKET AND A MARKET CAP OF ONLY $22M! Kicker: In 2006 the Chinese government passed a law prohibiting the licening of any further bromine producers. Thus GFRE is one of only six companies producing bromine in China and the state has declared that there will be no further competition allowed. Could this story get any better? *Bromine is a non-renewable resource. Bromine is only found in large quantities in four countries: the United States, Israel, Jordan and China. Already the largest player in the Chinese bromine market with over a 20% market share, we plan to aggressively pursue additional complementary acquisitions, which coupled with sustained organic growth, will help us become a dominant worldwide player in the bromine industry. In addition, we expect ancillary growth from the portfolio of specialty chemical products we manufacture for the oilfield industry. Gulf Resources, Inc. will continue to be a prominent figure in the Chinese chemical industry while obtaining international recognition. Link to the March, 2008 article in Equities Magazine. I usually own shares of a company before touting them on my blog. In the past few months, probably due to some prescient market calls, my readership has grown significantly. Thus any stock I write up, like Gulf Resources, is likely to get a certain amount of buying upon publication of the blog, causing a pop in price. I DON'T NEED TO MAKE MONEY LIKE THAT. As I write this on Saturday morning, I do not own a single share of GFRE. 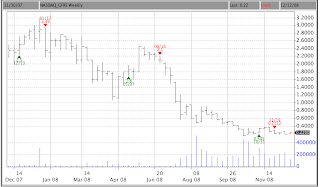 In fact, I would prefer to wait for the break-out above $0.25 before purchasing these shares. If the stock opens Monday and trades above $0.25, I expect to begin accumulating the shares. Since I expect near term price gains to easily exceed $0.50, I'll buy at any price under 50 cents. Any price higher then 50 cents will cause me to probably wait for a pullback. This is my road map to purchasing GFRE, subject to change of course, but this is how I am intending to play it as of now. Take a good long look at the GFRE charts, read the above linked article from Equities Magazine and go explore the company's web site. Then make up your own mind. News of the failure of the auto bailout has tanked an already weak market sending S&P globex futures down over 40 points from Thursday's close. This on top of the late day's drop of 25 points is clearly an impulsive wave down, probably igniting the next drop to new market lows. If so, the 7500 level on the DJIA should be tested and breached by this move. 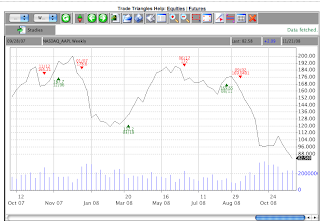 Our mechanical trend following system a/k/a Trade Triangles flipped to a Buy on Monday, after being on a very profitable Sell since early September. 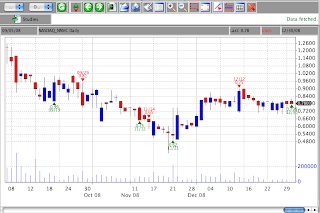 The Daily NNVC system still clings to it's recent Buy from some 30% lower. Make no mistake about this one, I DO NOT trade in and out of NNVC. When this one hits, it will be unforgiving to anyone not yet in and that is not a risk I am willing to take. Until further notice, buy on Buys and hold on Sells. The Q's are more problematic. It was easy to be Short on the Sell signal because so much else was pointing to a hard down autumn. The current rally was strong enough to trigger the Buy (unexpected) but the patterns that I find so useful, Elliott Wave and NeoWave, are both still pointing hard down as soon as this rally peters out. When will that be? 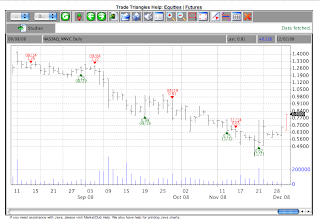 The triangles will catch it after it has built some momentum. I hope to catch it earlier and will try to post what as soon as I think this next leg down has started. Meanwhile, it's day-trading for me, which has been doing just fine, thank you. Every December I go into the last two weeks of the month swearing to take some time off because nothing trades right around the holidays. Yet every year, I am at the helm, thinking a few decent trades are better then no decent trades and anyway, with all the stress there is no such thing as down time around the holidays. With what should be a heck of a dive coming in the indexes, this is not a time I want to be away from trading. Opportunities like those of the last three months don't come along that often and with my expectations as they are, it's no time to go bowling. 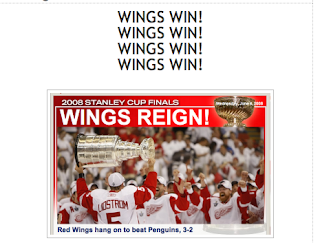 But it is time to go to a hockey game. I will be at Jobing.com arena Saturday night to watch the Phoenix Coyotes host the Detroit Red Wings. Last year Red Wing jerseys outnumbered Coyote jerseys about two to one. It's like going to a home game, without the snow, cold or boarded up businesses. Anyone who would like to buy me a beer, or give me a back rub, I'll be in section 116, Row T wearing a Red Wing sweat shirt......sitting next to a blond. Once again I have been moved by the magic elixir of song. Ten Easy Pieces is a collection of Jimmy Webb songs, performed mostly solo by Jimmy Webb, accompanied only by Webb's hand at the piano and sung so beautifully and soulfully that each exquisite song stands alone as a spiritual awakening, leaving no listener untouched or unmoved. You may have thought you heard these songs before, but think again, this is the truth, as it unravels the beauty and depth of romance, of love found, of love lost, of love eternal. Others may have told these tales before, but no one shared the feelings of living sentiment with the listener like this. Girl I heard your getting married, heard your getting married, this time your really sure. And this is the end, they say you really mean it, This guy's the one that makes you feel so safe, so sane and so secure, And Baby if he loves you more then me, Then maybe it's the best thing, maybe it's the best thing that can happen to you, But it's the worst thing that can happen to me. I love you, and that's all I know. My first sit down and listen to Ten Easy Pieces ended in tears. To this day I don't know if it was the music, the words, the memories, or someone, but the experience buried me. Now what, you ask, does he mean by, "Buried me?" Surely he is still among us, having obviously written and posted this review. I will leave that answer to this music. This is no collection of songs, this is the fabric of life itself, full, robust, passionate and sadly tragic. Touched by love, never the same, this music will touch and change you. I've been trying to write a blog on trend following for about a week now, but each time I sit down to write, there is yet another distraction in my thoughts, driving off the nearest exit and following some back road in my mind to places that have nothing to do with trend following. But persistence is a trait I have mastered and this subject is too important to be sidetracked by the assorted circumstances of an anything but staid life. This particular journey was too good to be left untold. I reluctantly paid a visit to Trader Joe's yesterday. I didn't want to go, but out of my daily trading nourishment staples, organic milk and cereal, I knew that if this task was not undertaken in a prompt and efficient manner, I would rue my laziness at a most inopportune time. So off I went, in my best impersonation of Hank Moody, rumpled clothes and two-day beard, gum in lieu of a hanging cigarette and only a passing hand upon my head as my grooming for the occasion. In the isle of juices, I came upon her. A 40ish blond, tall and thin, blue eyes deep and penetrating all encased in skin so creamy white and utterly appealing that my inquiry of her, "What does pomegranate juice taste like?" spurted out of me before my mind could alert me that coming on to strangers in public is tactless and rude and fully the most risky behavior in the middle of a Saturday that a single man can embark upon if he has any dignity or self respect left at all. Twenty minutes later I am leaving the store with her email address and a promise to make me her famous pomegranate martinis at some undetermined time, so I can integrate the juice of the pomegranate into my life that somehow, in my romantic stupor, was moronically stated as in need of the aphrodisiac qualities she described of this mysterious berry. I bring this up only to show how the time otherwise allocated to writing a blog about Trend Following was usurped by what can only be described as biological based unfettered insanity in the presence of such overpowering female power shrouded in a pink and white sun dress loosely clinging to a form so perfect that wars would be fought and armies slaughtered to return her to the throne to which she so clearly belongs. Pomegranate martinis. Such are the rewards that inure to the victors of market timing. What better allegory then this nectar of the Gods to remind us all what it is we are doing here. Our object is to win this game, pocketing the spoils of the market wars as those lessor souls forfeit to us in this marketplace of stocks, etf's, derivatives and gold. Humbly kneeling before the blond Goddess, oh ye of little faith, rise up and take your place among the victorious and righteous noblemen who through the ages have conquered their fear and vanquished their enemies before the magical splendor of Aphrodite. Morphed into a Sunday morning, refrigerator and pantry stocked, we turn once more to the art of living off of trading platforms on our screens, no commutes, no ties, no office politics, just one on one jousting for the pot that lays in the center of the table. As every day brings front page stories of fallen hedge funds, largely absent from the reporting are tales of the winners, the ones that take the pot game in and game out, for every dollar lost, a dollar is won, but who is leaving with the prizes? About three years ago, I read a book by Michael W. Covel, "Trend Following, How Great Traders Make Millions In Up Or Down Markets." In over 400 pages, the book made the case for trend following as the preeminent market strategy of our time. It heralded the work of Richard Dennis and is famous experiment of taking 20 novice traders and making the vast majority of them millionaires by teaching them a simple trend following algorithm. That trading methodology is almost identical, in it's core approach to trading, to the same basic tenants of Market Club's Triangle Trading which I have written about extensively over the past year. As for the aforementioned winners, who by definition have been cleaning the clocks of everyone else in this bear market, are the Trend Following hedge funds and traders who have been anchored short for the past 18 months because, well because the equity markets themselves have been in a steep downtrend. That's what trend followers do, they mirror the markets. Such a simple and colossal notion that by it's very humble and unassuming premise goes so largely unnoticed in the blogosphere, on CNBC, in the New York Times and in the myriad of esoteric notions on how to pick tops and bottoms, in concepts of oversold and overbought and sadly (for some) in the brokerage accounts of the vast majority of market participants. Chasing the latest market fad isn't all bad. Some investment funds that jump on trends are outperforming traders who pride themselves on outthinking the market. 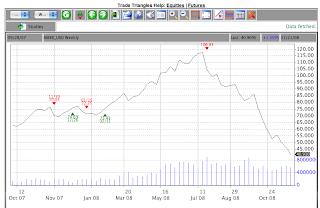 Increased volatility in markets from commodities to stocks is helping the trend followers profit. A particular category of trend-following funds called managed futures funds have outperformed hedge funds this year by making a killing from the dollar's rally, the plummet of emerging markets and the collapse of commodities. With $234.1 billion in assets, these funds gained 8.9% year to date through October, while the average hedge fund lost 18.9%, according to preliminary data from research firm Barclay Hedge. Barclay, which isn't related to Barclays PLC, doesn't consider managed futures funds to be hedge funds, though other data trackers do. What is the common denominator of "...the dollars rally, the plummet of emerging markets and the collapse of commodities..."? Trend following, in all of it's unsung glory. "Can a great trader have great skill and no opportunity to make money? Can a bad trader have no skill and tons of opportunity to make money? The answer is yes to both questions. Luck is at play in the short-term for most traders. There will always be "some guy" with a great one-year return, but the sustained edge appears only over time." What's Jon's big picture point? He wants you to think about what happens when the bad trader with no skill finally finds himself with no opportunity. If you don't want to embrace his wisdom, you will eventually feel the pain in your trading account. There will always be crictics, and there will always be cheerleaders. I, however, find solace in the performance numbers. And trend following performance numbers are the real story. No matter how many people agree or disagree with the content of this book, the performance numbers paint a picture you either accept or reject---it's your choice. Here is my "You Are Here" ( see arrow) map of the markets tonight. 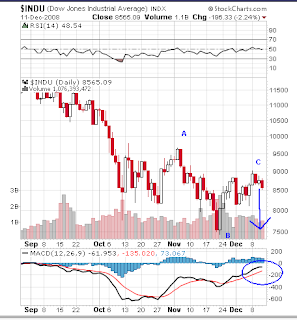 Note that 5 waves down ended November 24 to end Wave 3 down. There has been a three wave rally since that low, labled A-B-C covering the past week or so. C may have ended today, or may end tomorrow, or could extend into next week. The take away is that once C is complete, Wave 4 up is complete and Wave 5 of 5 down will commence to new lows, under 7500 on the DJI and maybe way, way under 7500. This is a good example of how I use Elliott Wave. The market will do whatever it wants to do, but I have identified a typical three wave pattern that is often a prelude to an new impulsive wave to the opposite direction. It's these wonderful impulse waves that we lay in wait for and that is where you will find me in the coming days. Above is the Weekly Q chart, revealing that it will take a print above 32 on the QQQQ to reverse the signal from Sell to Buy this week. Unlikely, but keep it in mind as this has been a very lucrative Sell trade and we don't want to get blindsided, unlikely as it may seem. As the above Daily chart shows, NNVC triggered long at 62 cents, now 80 cents, a gain of 29% in about a week, but with the Weekly now on board, this has the makings of a huge trade. The truth is, these four charts are all I am interested in tonight. I can flip through dozens of other charts but I know from my EW analysis that the lows have not been seen and that most any long trade here is full of risk, much more risk then I am willing to take. 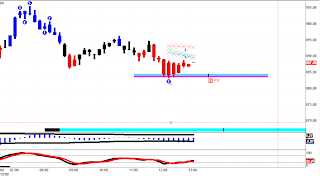 My game plan is to remain very long NNVC and short the market at opportune times. There are times to be wildly bullish and times to be a raving bear, neither of which is present right here, right now. Being mildly bearish and very excited about NanoViricides just might be the perfect strategy going into the end of the year. Keeping it simple has it's place too. "We are very excited to study the effectiveness of nanoviricides against the most current strains of H5N1 in animal models,” said lead AFIP scientist Dr. Mina Izadjoo. NNVC = The Company is developing anti-influenza drugs under the brand names FluCide™, and FluCide-HP™. FluCide is a broad-spectrum nanoviricide that mimics sialic acid, and therefore no influenza viruses (including bird flu) can escape it, no matter how much they mutate, say the Company scientists. FluCide-HP is expected to be more effective against all highly pathogenic avian influenza (HPAI) viruses than is FluCide, according to the Company’s proprietary data. 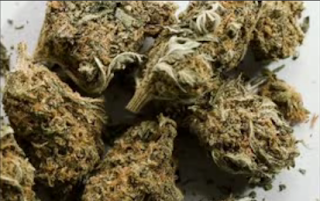 Any of the HPAI viruses may cause a potential pandemic, according to the World Health Organization (WHO). The most prevalent current HPAI virus is H5N1.